Understand that simmering ingredients in boiling water infuses the water with flavor, and apply that knowledge to make a variety of stocks, broths, and teas. Demonstrate safety and precision in a variety of basic knife skills. Use their knowledge of the timing required to prepare a range of recipes to coordinate as a group in preparing the recipes to be eaten at the same time. Make a simple vegetable stock by simmering chopped vegetables, shiitake mushrooms, and kombu seaweed, and seasoning with soy sauce and mirin. Julienne carrots and thinly slice sugar snap peas as toppings for their udon bowls. Coordinate as a group to prepare a number of components for their udon noodle bowls, timing them all to be ready to eat at the same time. Copy the Udon Noodle Soup recipe to hand out. Copy the Marinated Tofu recipe to hand out. Copy the Soft-boiled eggs recipe to hand out. Prepare three recipes of Marinated Tofu (preferably at least 12 hours before the first class in the rotation to allow time to marinate). Toast sesame seeds to be used in the Marinated Tofu. Welcome students back to the kitchen for the second class of their spring rotation. Introduce the recipe for the day: Udon Noodle Soup. Explain that udon noodle soup is a dish traditionally eaten in Japan, but also very popular in many places around the world in areas where people from Japan have immigrated at some point and introduced the food. Just like ramen, another example of a Japanese noodle soup, there are many kinds of udon eaten with a variety of broths and toppings that vary by region and season. What distinguishes udon as udon is the noodle. Udon noodles are thick wheat noodles that originated in Japan. But even though udon and other noodle soups like ramen are now very popular in Japan, the Japanese have not always made noodles. Ask students to recall the Silk Road lesson series from sixth grade: Do you remember where noodles originated? Noodles originated in China as early as 25 AD. About 800 years later, in the ninth century, they first came to Japan. There are many udon origin stories, but the most common one is that in the ninth century, a Japanese monk named Kukai traveled to China to study Buddhism. In the monasteries where he studied in northern China, one of the main foods was noodles. He thought noodles were delicious, and so when he went back to Japan, he brought back information on how to make thick wheat noodles. Over time, what we know today as udon slowly evolved. Traditionally, toppings were based on the season because when people first started eating udon mostly they were farmers and the only foods they had access to were the ones they grew or foraged for. We will also be using seasonal vegetables for our toppings. Right now it is spring. Ask students to think of vegetables that are currently in season. Right now broccoli is in season, so today we are going to roast broccoli as a topping. Ask students to recall from the previous lesson in which they made roasted potatoes the four steps for roasting vegetables: wash, cut, season and cook. Our other toppings today will include sliced carrots, scallions, and mushrooms, as well as soft-boiled eggs. Ask students to explain the difference between a soft-boiled and a hard-boiled egg. Soft-boiled are similar to hard-boiled eggs, but with a runnier yolk. Tell students they will hear more about the recipes and jobs in their table groups. Check-in question: What is your favorite kind of soup? Everyone will start by preparing the udon broth. To make the broth we will simmer chopped vegetables, including the dried mushrooms and kombu, in water. This extracts their flavor. After making the broth, there are three job groups: Roasted Broccoli, Marinated Tofu, and Toppings. Remind students again the four steps for roasting: wash, chop, season with oil and salt, and bake. Explain that the Marinated Tofu recipe is a pay-it-forward model because the longer the tofu marinates, the more flavor it absorbs. Demonstrate how to slice scallions and sugar snap peas thinly on a bias and how to julienne a carrot. We will cook soft-boiled eggs and noodles towards the end when we are almost ready to eat. Divide students into job groups. Cook, clean up, and eat. If there is time, ask students to share what toppings they would add to their noodle soup if they were to make it at home. Student-created lesson: This lesson was created by five eighth-grade students who worked with us for the 2016-17 school year as IWEs (Independent Work Experience). Designing the lesson from start to finish—including brainstorming and deciding on the recipe and lesson focus, recipe testing, researching and developing the Chef Meeting and Small Group meetings, creating the lesson materials, and teaching the lesson in the classroom—was one of the major projects they worked on during the year. 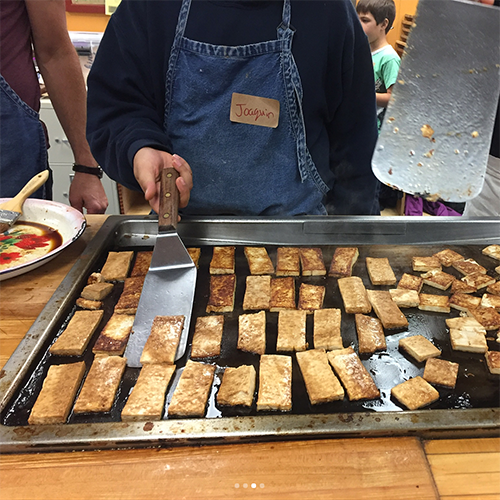 Cooking jobs: During the small-group check-in, students chose between three jobs: marinated tofu, roasted broccoli, or toppings. Whichever students finished their job first moved on to work on eggs and noodles. Knife skills: This is a great lesson for students to practice focus and precision with their knife skills. Add or modify any toppings to teach any knife skills. Cooking techniques: Because this lesson is one of the four leading up to our Iron Chef challenge, in which seventh grade students plan and prepare a meal independent from adult help, we make sure to highlight the transferable cooking techniques they’re using. We point out that this is a second way of preparing eggs (after the scramble they created in the previous lesson), and the second time they’ve roasted a vegetable (after the potatoes from the previous lesson). Making the broth: We had all students in each group start by working on the broth. Starting ingredients simmering early allowed it time to develop a full flavor. This also simplified the workflow of the lesson because every student could move on from the broth to their designated job. Mirin: Mirin is a cooking wine often used in Japanese cuisine. It contains a small amount of alcohol that cooks out while the broth simmers. We chose to use Eden brand because it doesn’t list alcohol content on the outside of the bottle, and also doesn’t contain any additives that many other brands have. Salty soy sauce: Encourage students not to add salt to the broth while it cooks because they’ll add soy sauce later in the cooking process. Kombu and mushrooms: The kombu and mushrooms both add a savory meaty flavor to the broth. While the mushrooms are excellent cooked for as long as possible, the kombu should be added at the end and simmered gently. Take care not to boil the kombu too long or hard because it may leave a fishy flavor in the broth. The mushrooms can be reserved after the broth has finished cooking and sliced to be used as udon toppings. Flavorless veggies: Our students were often consternated at first to see the vegetables used to make the broth going in the compost because to them it seemed very wasteful. They were delighted to taste them, though, and discover that they had lost their flavor, which was now in the broth. Soft-boiled eggs: Not every student wanted a soft-boiled egg so we often had one student take “egg orders.” Sometimes if very few students ordered an egg, we would cook a few extra. Though students could initially be skeptical of soft-boiled eggs, they tended to love them in the udon broth. The soft yolks add a delicious richness. Straining the broth: This felt scary for some students. We intentionally taught them how to pour away from themselves to avoid being burned by steam, and sometimes did it ourselves depending on how comfortable the students were with it. Pay-it-forward tofu: We used a pay-it-forward model for the marinated tofu where each class made tofu for the following class and ate tofu prepared for them by the previous class. This gave the tofu time to marinate and become very flavorful. Marinating: Have students taste the tofu before and after they season it to see how tofu absorbs flavor. Have them also compare the flavor of the marinated tofu they make, and the marinated tofu made by the previous class to see how flavor soaks in over time. If they want to, they can season the already-marinated tofu with a little more of the same ingredients to layer and intensify the flavors. Medium to firm tofu: We used medium or firm tofu for this recipe (not soft or extra-firm). Tofu literacy: We were surprised how many students were baffled by how to open a package of tofu. We started explicitly teaching this to each tofu group, showing them how to open it at the sink and drain the liquid before taking out the tofu. Tofu sauce: Try pouring some of the marinated tofu sauce into your broth. It’s delicious! Toasted sesame seeds: We toasted sesame seeds in advance because it was one job too many for our 90-minute classes. Timing and stove space: We used two burners to complete all the components of this meal. On one burner we made the broth. On the other burner we boiled a large pot of water and first boiled the eggs, then cooked the noodles in the same water. If you do this, make sure to cook the eggs early (about 20 minutes before sitting down to eat) to make sure you have enough time to get the water back to boiling and cook the noodles after the eggs are done. Bringing it home: This recipe is very popular with students, and we always make sure to point out how easy it is to make at home. Students can make their own broth, or use any premade broth, dried noodles, and any toppings they like. Table etiquette: We point out that this style of food originated in a place with different etiquette and norms around eating. Encourage students to hold the bowl close to their mouths while they eat to minimize dripping and to drink from the bowl like a cup to enjoy all the broth. Awareness of self and others: This lesson is a great opportunity for students to practice awareness of self and others while eating. We had students serve themselves, but pointed out that they should be aware of how much food they take so that everyone gets a fair share. Popular recipe: Our students loved this food. It was one of our most Instagrammed recipes.